I love Puyo Puyo. I'm terrible at the games, but I can't resist matching those blobbular globs with their soulful eyes. I also happen to be quite the Tetris master. I've been playing since kindergarten, which was (cough) 25 years ago. Put those two facts together, and you have a prime representative of Puyo Puyo Tetris' target audience. Which means the second the demo was uploaded to the Japanese 3DS eShop, I was on it. Puyo Puyo Tetris is Sega's collaborative publisher that mashes together the best of two puzzle worlds. I guess you could say you got Puyo Puyo in my Tetris, but the reverse is also true. It's a purely competitive game where players face off against opponents both virtual and physical by perfectly placing Puyos and tetrominos. But enough talk. You want to know what it's like and, as someone so addicted to both games, I'm happy to oblige. 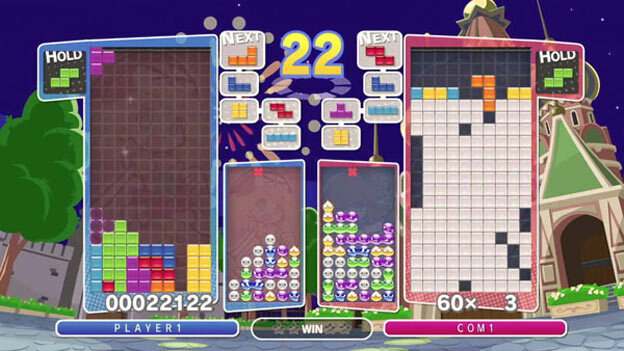 The Puyo Puyo Tetris demo only offers a glimpse at one gameplay mode, Versus. Don't worry, it's only there to offer a taste, as the full game has had other modes revealed so far. But before I could launch into the fight of my life, I had to pick a character as an avatar. The demo offered five: Arle, Amitie, and Ringo are there, representing the Puyo Puyo series, while O and T are there for Tetris. As far as I could tell, the differences in the demo were purely cosmetic. Ringo didn't have her Puyo Puyo 7 dropset, when I was using her and playing Puyo Puyo. Since this was a Versus demo, I also was able to choose which game my character would be playing in the match, who I'd be facing, and what game he or she would play. 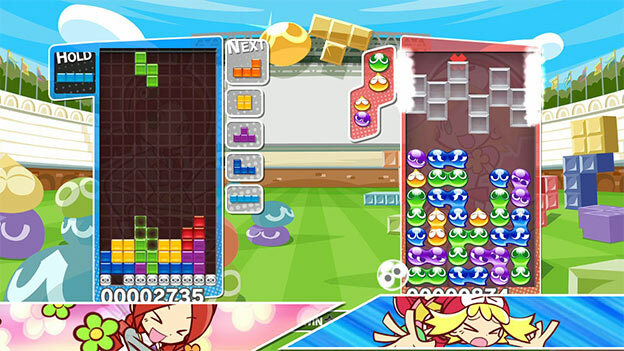 When Versus rules are in effect, one player can be playing Puyo Puyo while the other plays Tetris, or vice versa, or both people can be playing the same game. It's a best out of three situations, which means the first person to win two matches gets bragging rights. This means this Puyo Puyo Tetris mode is quite similar to the standard Puyo Puyo or Tetris multiplayer matches. Making lines in Tetris or eliminating groups of Puyos in each respective game sends nuisance blocks or Puyos into your opponent's field. Naturally, clearing four lines in Tetris or setting off a Rensa (chain reaction) in Puyo Puyo sends more blocks your opponent's way and makes their life more miserable. There are also some edges to playing either game in Versus mode. Those who choose Tetris will have the option to hold one select piece on the side and deploy it whenever they'd like. They're also able to see the next five pieces that will drop. Puyo Puyo players only get to see the next two Puyo pairs in line, but given the diabolically strategic nature of Puyo Puyo, this only seems fair as they could unleash an unending Rensa of hurt on their opponent. Unfortunately, the 3DS Puyo Puyo Tetris demo didn't cover some of the more intriguing modes--Versus is only scratching the surface. Not only has a story mode been confirmed, but so have Classic modes, where people just play either Puyo Puyo or Tetris, an online Party mode for multiple players, and the more appealing Big Bang, PuyoTetMix, and Swap modes. If those last three had been part of the demo, I wouldn't even be writing this preview because I'd be engaged in a 72 hour Puyo Puyo Tetris-thon. Big Bang is the mildest of the three most intriguing Puyo Puyo Tetris games so far, which is saying something as it sounds quite stressful. It's basically Versus, but the stakes are raised as the Puyo Puyo side is constantly in Fever, while the Tetris side is constantly in a state of Lucky Attack. While I've never experienced the latter, I'm quite familiar with Puyo Puyo's Fever rule. If you've got the Fever, you'll have a series of preset Puyo chains to try and clear. Eliminate them, and you get the satisfaction of building up tons of nuisance Puyos that fall on your opponent. Mess up once, and you feel like an idiot because you break the chain. Big Bang capitalizes on that by squirreling away all Puyo Puyo and Tetris player's nuisance Puyos and blocks and unleashing them in, well, one big bang on the losing player. Puyo Puyo Tetris' PuyoTetMix is a mode I can barely even visualize, because it sounds mindblowing. It's Puyo Puyo and Tetris all together at once. You're getting both Puyos and tetriminos dropped on you, with 1x1 and 2x2 tetrimino blocks being dropped alongside the ones everyone knows and loves. When a tetrimino drops, it will crush all Puyos beneath it to land at the bottom. So you have to focus on clearing the blocks at the bottom of your screen, while also managing and matching the Puyos that fall and are placed on top of them. That means no fancy, last minute manuvering of blocks when Puyos are in the way. If that doesn't sound harrowing enough, let's also factor in the shifting block/Puyo that will haunt your nightmares. It constantly shifts between two Puyos and a tetrimino until it finally lands. It almost makes the final mashup mode, Swap, sound manageable. 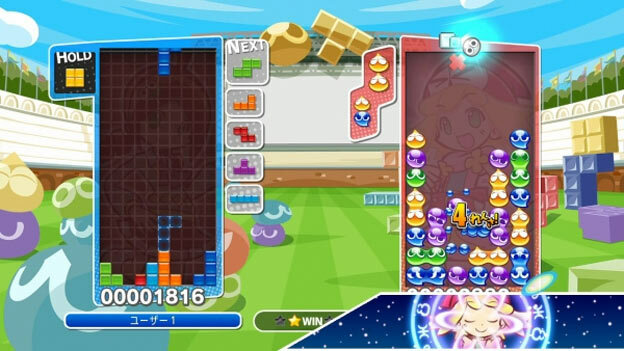 This Puyo Puyo Tetris challenge gives a player two boards. Every 24 seconds, these boards will switch. I hope you have good time management skills. As the timer clicks down, you'll see the inactive board start pulsating. That's a warning to quickly drop the Puyo pair or tetrimino that's falling into a decent spot, because when time's up, it's up. You're going to the other game, and the piece that was dropping in the other board will fall where it may. Of course, the missed opportunity to sample these additional game modes is only one lament I have about the 3DS Puyo Puyo Tetris demo. The other is that it is limited to only five uses. Still, even one use was enough to provide a glimpse at what Sega has in store for us with what is probably the most unlikely puzzle mashup ever, and it left me hoping for a US release. For the moment though, it looks like Puyo Puyo Tetris is only headed to 3DS, PS3, Vita, and Wii U in Japan this February. Still, Puyo Puyo and Tetris are fan favorites worldwide, and I wouldn't be surprised to see it in other regions before 2014 ends. 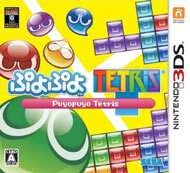 Over 7 gameplay modes, including classic Puyo Puyo and Tetris, as well as new PuyoTetMix and Swap. Classic Puyo Puyo characters and new Tetris -inspired characters face off. Puyo Puyo finally goes HD.